Northeastern&apos;s Vasa Pusica averaged 17.9 points per game last season. Scouting reports on the seven NCAA Division 1 men’s and women’s college basketball programs in Massachusetts. Last year: 7-23 (2-14 ACC, 13th place); lost ACC tournament first round to North Carolina, 69-64. Coach: Joanna Bernabei-McNamee (first season). Key players: Taylor Ortlepp (junior guard), Georgia Pineau (junior forward), Milan Bolden-Morris (sophomore guard), Emma Guy (junior forward). Outlook: With a new coach and no seniors on the roster, this could be a rejuvenation for a struggling program. 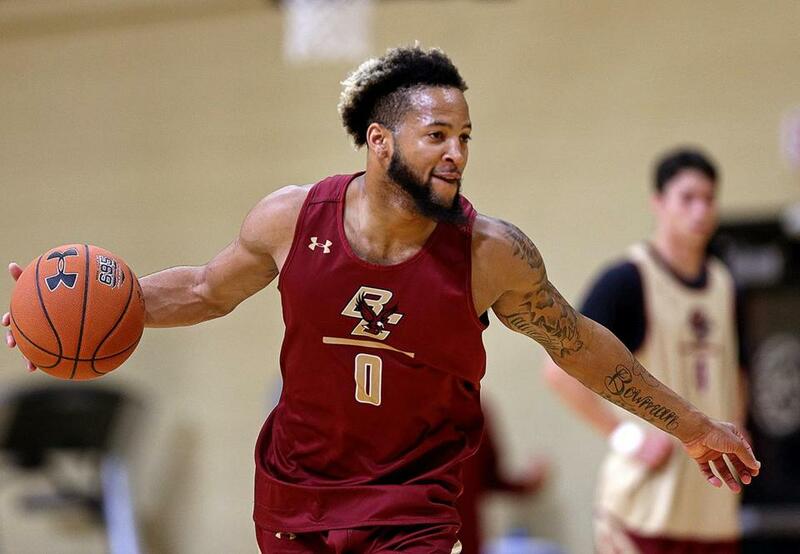 BC returns its top four scorers and is putting an emphasis on improving on both sides of the ball in conference play. Opening game: Nov. 8 vs. Rhode Island (7 p.m.). Last year: 10-19 (5-13 Patriot League, ninth place; lost Patriot League tournament first round at Lafayette, 66-61. Coach: Marisa Moseley (first season). Key players: Nia Irving (junior forward), Katie Nelson (sophomore guard), Payton Hauck (senior guard), Naiyah Thompson (senior forward). Outlook: A first-year coach with an experienced team may be the recipe for a Terrier turnaround. But lacking in height, BU will struggle on both ends in the paint. Opening game: Nov. 9 at Northeastern (noon). Harvard’s Kathy Delaney Smith is the winningest coach in Ivy League history. Last year: 18-11 (10-4 Ivy League, third); lost WNIT first round at Fordham, 65-47. 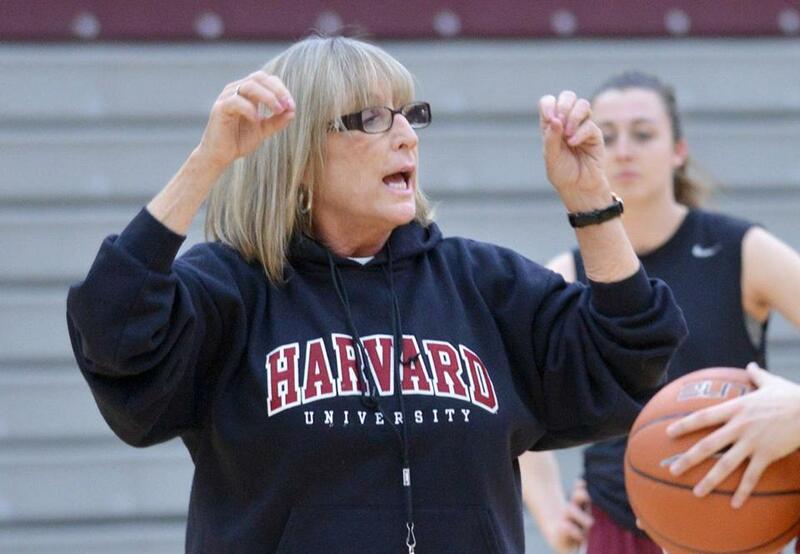 Coach: Kathy Delaney-Smith (37th season), 603-406 at Harvard. Key players: Katie Benzan (junior guard), Jeannie Boehm (junior forward), Madeline Raster (senior guard), Sydney Skinner (senior guard). Outlook: Picked third in the Ivy League preseason poll, the Crimson are an experienced bunch featuring a balanced scoring attack and a strong interior game. For Harvard to improve upon last year, it must shore up the defense. Opening game: Nov. 9 at Notre Dame (4 p.m.). Last year: 13-18 (7-11 Patriot League, seventh place); lost Patriot League semifinals at Bucknell, 67-53. Coach: Bill Gibbons (33rd season), 602-401 at Holy Cross. Key players: Lauren Manis (junior forward), Madalyn Smith (junior guard), Jenay Faulkner (sophomore guard), Megan Swords (junior center). Outlook: The Crusaders may feel slightly disrespected by being picked sixth in the Patriot League preseason poll. Manis is the conference’s Preseason Player of the Year on a team returning many of its top players. Holy Cross is considered one of the top offensive teams in a strong Patriot League. Opening game: Nov. 11 vs. Rider (7 p.m.). 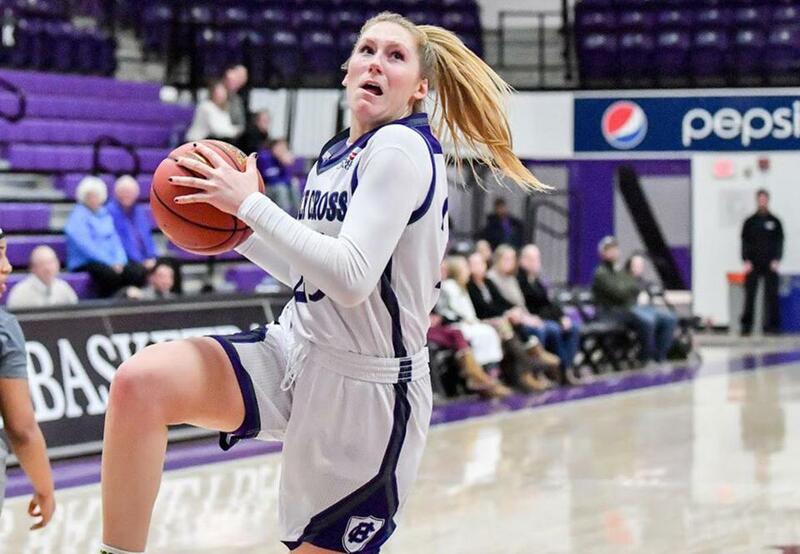 Lauren Manis led Holy Cross with 17.5 points per game last season. Last year: 14-16 (6-10 Atlantic 10, 10th place); lost A10 tournament first round to Saint Louis, 70-64. Coach: Tory Verdi (third season), 23-37 at UMass. Key players: Hailey Leidel (junior forward), Bre Hampton-Bey (sophomore guard), Genesis Rivera (senior forward), Paige McCormick (sophomore guard). Outlook: A strong start is key this year, as is limiting turnovers after the Minutewomen averaged 15 per game last season. UMass has improved in two seasons under Verdi but has yet to make waves in postseason play. Opening game: Nov. 6 vs. Sacred Heart (4:30 p.m.). Last year: 4-26 (1-15 America East, ninth place); lost America East tournament first round at UMBC, 73-65. Coach: Tom Garrick (first season). Key players: Brianna Rudolph (graduate guard), Megan Hendrick (junior guard), Oda Shackelford (senior forward), Linda Svenne (sophomore guard). Outlook: The only direction is up for the River Hawks, with a new coach who set program records at URI. But with several members of last year’s team gone, can they rebuild? Opening game: Nov. 6 vs. Bryant (7 p.m.). Last year: 16-15 (11-7 Colonial Athletic Association, fifth place); lost WBI first round to Yale, 68-58. Coach: Kelly Cole (fifth season), 47-75 at Northeastern. Key players: Jess Genco (senior guard), Gabby Giacone (senior forward), Shannon Todd (junior guard), Stella Clark (sophomore guard). Outlook: Picked fifth in the CAA preseason poll, the Huskies feature a strong, layered defense. Opponents will have difficulty penetrating the paint and generating offense from the perimeter against a speedy and experienced team. Opening game: Nov. 9 vs. BU (noon). Last year: 19-16 (7-11 ACC, 12th place); lost NIT first round at Western Kentucky, 79-62. Coach: Jim Christian (fifth season), 48-83 at BC. Key players: Ky Bowman (junior guard), Jordan Chatman (senior guard), Steffon Mitchell (sophomore forward), Nik Popovic (junior center). Outlook: The departure of last year’s leading scorer, Jerome Robinson, will present a challenge. With just three seniors, a young BC team looks to build on its valuable experience from last year and welcomes a talented freshman class. Opening game: Nov. 6 vs. Milwaukee (7 p.m.). Last year: 15-16 (10-8 Patriot League, fifth place); lost Patriot League semifinals to Bucknell, 90-59. Coach: Joe Jones (eighth season), 122-102 at BU. Key players: Max Mahoney (junior forward), Tyler Scanlon (junior forward), Walter Whyte (sophomore guard), Javante McCoy (sophomore guard). Outlook: The Terriers enter what could be a redefining season behind just one senior and three juniors. Under the tutelage of Jones, BU is expected to be among the top teams in the Patriot League. Opening game: Nov. 6 at Northeastern (8 p.m.). Ky Bowman led BC in assists last season with 165. Last year: 18-14 (12-2 Ivy League, second place); lost NIT first round at Marquette, 67-60. Coach: Tommy Amaker (12th season), 189-83 at Harvard. Key players: Seth Towns (junior forward), Justin Bassey (junior guard), Chris Lewis (junior forward), Bryce Aiken (junior guard). Outlook: A year after claiming a share of the Ivy League title, the Crimson have been picked to repeat as conference champions. Led by a strong junior class, Harvard faces a tough nonleague slate but remains poised to make it back to the NCAA Tournament. Opening game: Nov. 6 vs. MIT (7 p.m.). Last year: 12-19 (8-10 Patriot League, sixth place); lost Patriot League semifinals to Colgate, 62-55. Coach: Bill Carmody (fourth season), 42-56 at Holy Cross. Key players: Jehyve Floyd (senior forward), Austin Butler (sophomore guard), Caleb Green (sophomore guard), Jacob Grandison (sophomore forward). Outlook: Voted fifth in the Patriot League preseason poll, the Crusaders are hoping to improve defensively. With an impressive sophomore class and three talented seniors, they feature a balanced scoring attack that could prove dangerous in conference play. Opening game: Nov. 6 vs. Sacred Heart (7 p.m.). Last year: 13-20 (5-13 Atlantic 10, 13th place); lost A10 tournament second round to George Mason, 80-75. Coach: Matt McCall (second season); 13-20 at UMass. Outlook: After an inauspicious first season under McCall, the Minutemen return without leading shooter and rebounder Malik Hines. More than anything, UMass will aim to clean things up after averaging 12.8 turnovers and 32.8 rebounds per game in 2017-18. Opening game: Nov. 6 vs. UMass-Lowell (7 p.m.). 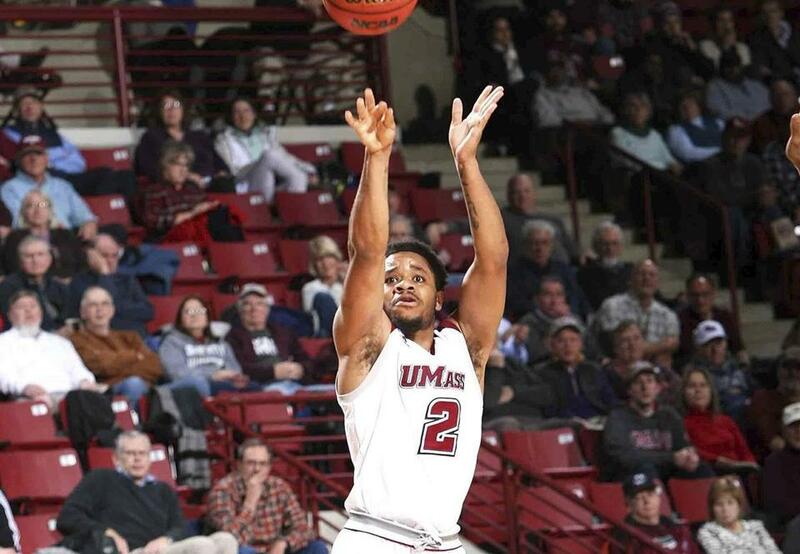 Luwane Pipkins shot 42.6 percent on 3-pointers for UMass last season. Last year: 12-18 (6-10, sixth place America East); lost in America East first round to UMBC, 89-77. Coach: Pat Duquette (sixth season), 56-91 at UMass-Lowell. Key players: Ryan Jones (senior guard), Josh Gantz (redshirt senior forward), Shawn Jones (senior guard), Obadiah Noel (sophomore guard). Outlook: With last year’s top two scorers graduated, the River Hawks are looking for a new leader on an experienced team. Jones may be the guy, but can he keep them from finishing rock-bottom in the conference, as they have been picked to do? Opening game: Nov. 6 at UMass (7 p.m.). Last year: 23-10 (14-4 Colonial Athletic Association, second place); lost CAA tournament championship to Charleston, 83-76. Coach: Bill Coen (13th season), 201-186 at Northeastern. Key players: Vasa Pusica (redshirt senior guard), Anthony Green (senior center), Shawn Occeus (junior guard), Donnell Gresham Jr. (redshirt junior guard). Outlook: The Huskies are projected to finish atop the CAA, returning their entire starting lineup from a year ago. A team that held opponents to under 70 points per game on average last year, Northeastern is in line for an NCAA berth, barring another conference title-game collapse. Opening game: Nov. 6 vs. BU (8 p.m.).